A petition to the United States Congress and the governments of Australia, Italy, the Netherlands, Norway, Turkey, the United Kingdom, Israel, Japan, South Korea, Denmark, and Canada from the world and from the people of Burlington, Vermont, and Fairbanks, Alaska, where the F-35 is to be based. Initiated by Vermont Stop the F35 Coalition, Save Our Skies Vermont, Western Maine Matters, Alaska Peace Center, University of Alaska Fairbanks Peace Club, North Star Chapter 146 Veterans For Peace, World Beyond War, RootsAction.org, Code Pink, Ben Cohen. Supported by: Centro Documentazione Manifesto Pacifista Internazionale, International Organization for the Elimination of All Forms of Racial Discrimination, Nej tak til nye kampfly (in Denmark), Peaceful Skies Coalition (in Santa Fe, NM), Straits Area Concerned Citizens for Peace, Justice, and the Environment (in Michigan). The F-35 is a weapon of offensive war, serving no defensive purpose. It is planned to cost the U.S. $1.4 trillion over 50 years. Because starvation on earth could be ended for $30 billion and the lack of clean drinking water for $11 billion per year, it is first and foremost through the wasting of resources that this airplane will kill. Military spending, contrary to popular misconception, also hurts the U.S. economy (see below) and other economies. The F-35 causes negative health impacts and cognitive impairment in children living near its bases. It renders housing near airports unsuitable for residential use. It has a high crash rate and horrible consequences to those living in the area of its crashes. Its emissions are a major environmental polluter. Wars are endangering the United States and other participating nations rather than protecting them. Nonviolent tools of law, diplomacy, aid, crisis prevention, and verifiable nuclear disarmament should be substituted for continuing counterproductive wars. Therefore, we, the undersigned, call for the immediate cancellation of the F-35 program as a whole, and the immediate cancellation of plans to base any such dangerous and noisy jets near populated areas. We oppose replacing the F-35 with any other weapon or basing the F-35 in any other locations. 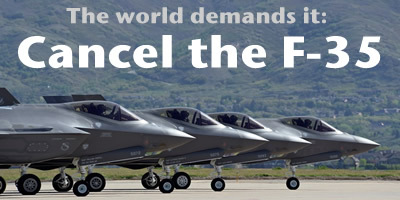 We further demand redirection of the money for the F-35 back into taxpayers' pockets, and into environmental and human needs in the U.S., other F-35 customer nations, and around the world, including to fight climate change, pay off student debt, rebuild crumbling infrastructure, and improve education, healthcare, and housing. 34102 4 months ago Lora Chamberlain Chicago, IL , US Just Stop making these weapons of war - enough is enough - the American people, the people of the World are soooooo done with War!!! To endorse as an organization click here. The F-35 will kill and destroy while making us all less safe. The F-35 is a first strike stealth weapon designed to penetrate air space undetected. It will be used for massive killing and destruction in more wars like Iraq, Libya, Yemen, Syria, and Vietnam in which millions of civilians have been killed and wounded and millions of refugees created. Despite the misery they caused, these wars did not make people in the United States safer, and they made things worse in each of the countries that U.S. warplanes and soldiers attacked. In fact, CIA director John Brennan told the U.S. Senate Intelligence Committee on June 16, 2016, that the wars since 2001 have not worked: “… despite all our progress against ISIL on the battlefield and in the financial realm, our efforts have not reduced the group’s terrorism capability and global reach.” In fact the war on terrorism has predictably and demonstrably increased rather than reduced terrorism. Gallup polling now finds that much of the world considers the United States the greatest threat to peace on earth. Nor is a fighter/bomber, like the F-35, capable of protecting anyone against nuclear ICBMs, cruise missiles, cyber attacks, global warming, or any individual acts of terrorism. The F-35 is designed for, among other things, delivery of the B61-12 nuclear weapon. Alaska's Congressional delegation has indicated several times that the F-35 is right for Alaska because of its proximity to Russia, making this weapon part of the new and perilous cold war. The F-35 is a damaging trade-off. 1. Cost: The U.S. Air Force says the F-35 program will cost $1,400,000,000,000 over 50 years. The F-35 strips public money to pay private war contractors, like Lockheed Martin, that could better be spent to alleviate suffering, erase student debt, rebuild roads and bridges, defend against global warming, and provide education, health care, and housing. The money taken from such vital public use goes instead to war profiteers, increasing inequality and social division in the United States and elsewhere. 2. The F-35 destroys far more jobs than it creates: Researchers at the University of Massachusetts* report that each billion dollars spent on military preparations costs the United States between 4 and 16 thousand jobs as compared with tax cuts for working people or identical spending on clean energy, healthcare, or education. Thus, the $1.4 trillion, 50-year F-35 program means fewer jobs in the 45 U.S. states involved. 4. The F-35 makes houses unsuitable for residential use: The Federal Aviation Administration says there is no effective mitigation for this noise besides families leaving. In Burlington Vermont, where F-16 jets are now based, the federal government paid to purchase and demolish 150 affordable homes to protect the people from damaging F-16 noise. The U.S. Air Force says that basing 18 F-35 jets at the airport in Burlington will cause 2,252 acres of land holding 2,963 households with 6,663 people to be in the “unsuitable for residential use” noise zone. 5. The F-35 has both a high crash risk and high crash consequences: The U.S. Air Force says all new military jets have a very high risk of crashing. The F-35 has far worse consequences when it crashes in or near people than older jets. Whereas older military jets were made of aluminum, the body of the F-35 is made of military composite materials with a stealth coating which emit highly toxic chemicals, particles, and fibers when set on fire during the inferno when thousands of gallons of jet fuel burst into flames. An Air Force report says this catastrophe should not be allowed to happen near people. The only way to prevent this tragedy from happening is to prevent basing of such military jets in or near densely populated areas, like Burlington Vermont or any of the other towns and cities planned for basing.